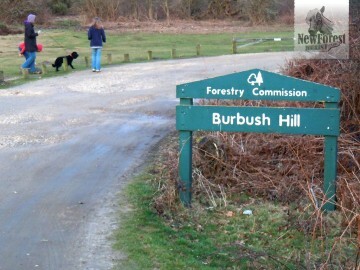 Walk Start / Walk Finish: Burbush Car Park, Burley (circular walk). Distance: About 4.5 miles (a couple of hours if walking non-stop). Parking: Free parking at Burbush Car Park. 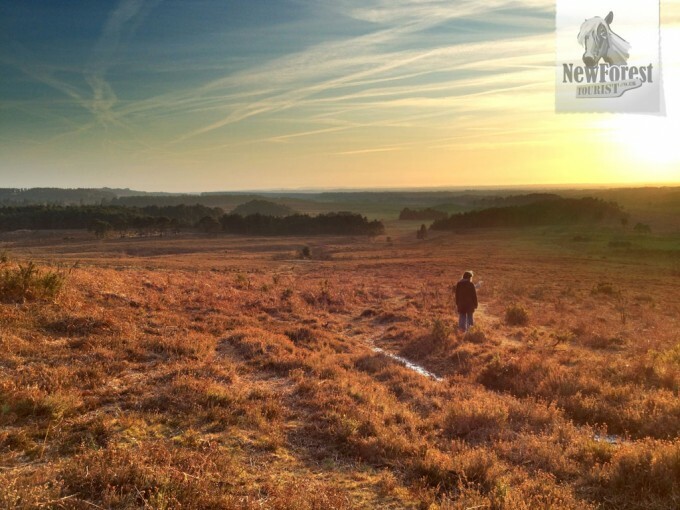 Defining Features: For me the biggest surprise was the staggering view over Kingston Great Common, particularly at sunset. 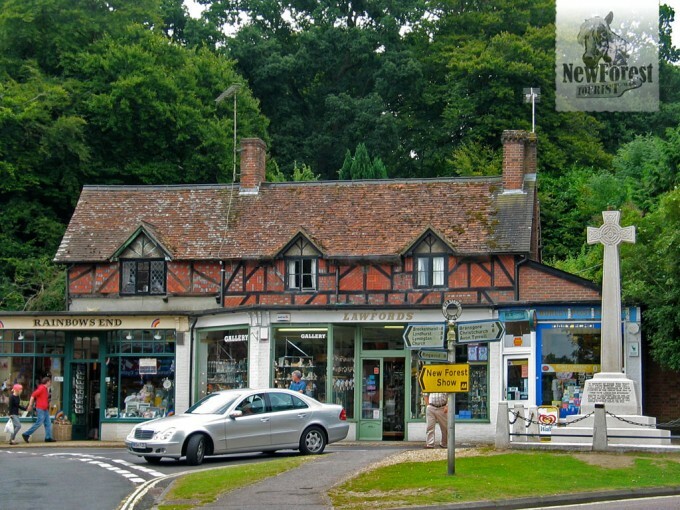 Pros: Lots of variety along the way, including village shops, pubs and tea rooms as well as vast swathes of open forest. Cons: A particularly unpleasant stretch of busy, narrow road can’t be avoided, and with children in tow these crossings are brief but scary. 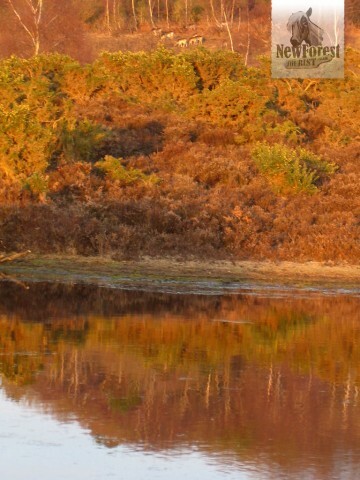 The walk around Burley that begins at Burbush car park, adjacent to Slap Bottom, takes in everything from stirring views of heath and heather to a bustling village, woodland walks and foray up rather a grand private driveway. 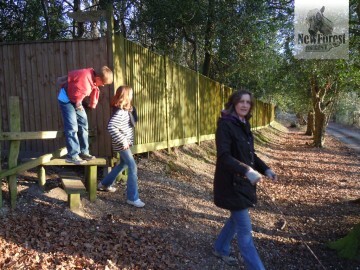 At the end of the carp park, walk to the far end, over the rise and down to the old railway line and start walking. 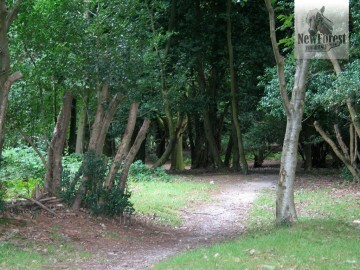 You can only go left, as to the right the line has been reclaimed by the forest and has become a modest canal of sorts. With the occasional traffic cone pointing out of it. As you begin the walk the banks rise high to the left and right until you see the familiar heath rising up to the sky. Eventually the banks lower and the vista flattens out. 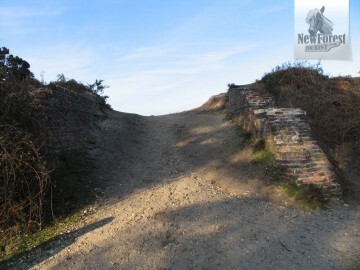 This pathway is shared with both cyclists and pedestrians (other than New Forest Ponies and other animals, naturally) but is easily wide enough for there to be room for everyone. Continue past old level crossing gate posts where a left turn could be taken as a short cut. Other railway relics still protrude from the ground on either side, although evidence of the actual sleepers and rails is scarce. Eventually you’ll come across the old Greenbridge bridge, now demolished apart from the red brick abutments which blend in with the banks. Turn left here and make your way up a brief rise. Once over the crest you’ll be presented with a spectacular, sweeping view across the forst. The white clay path that you’ll follow weaves its way up into the distance. 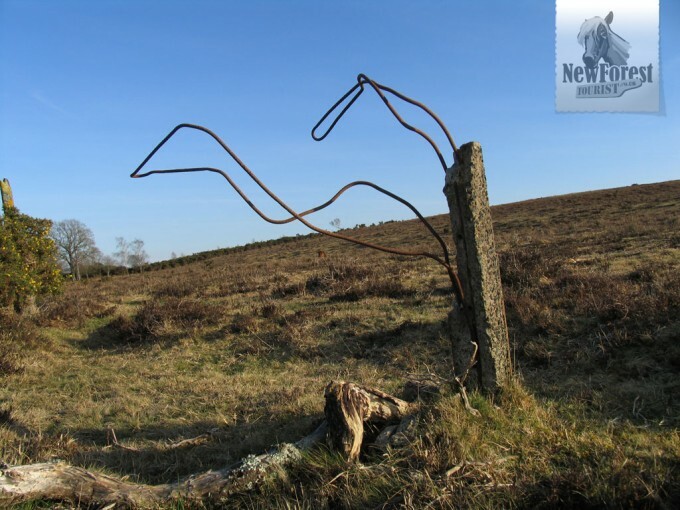 As I set off and cast my eye over the landscape ahead, the only blemishes I could see were the occasional car beetling along the otherwise hidden road towards Sway and Lymington, and an inevitable network of telegraph poles cutting through the entire valley. Turf Hill ahead has a deceptively steep crest, but once over the top it flattens almost immediately and you’ll carry on towards Burley, with Slap Wood over on the left. As the heather turns to gorse bushes and the trees approach you’ll come upon a long car park which (had we taken the left turn short cut from earlier) we would have passed through 20 minutes earlier. Going straight over the car park, head into the woods. There’s a path that leads all the way (after crossing in front of the Moorhill House Hotel) down to the centre of Burley Village; you’ll come out with the Queen’s Head pub to the right and the War Memorial to the left. Head for the War Memorial and turn right. This is where you need to watch out for the traffic; the pavements are narrow if present at all, and squeezing past the Burley Tea Rooms is not a pleasant experience when the traffic is flowing. The first time I took this route at this stage I began to regret the decision to press on through Burley, but once this short section was behind me, the decision became entirely justified by the magnificence of Kingston Great Common, a short distance away. After a while you’ll come to Clough Lane on the left hand side. By this point the pavement had widened, but opposite Clough Lane we had to cross to a small metal gate signposted to Burley Street. This led to a pathway running safely adjacent to the busy road below to the left, at the end of which we had to cross again; and once again the corner to the left was blind, so be extremely wary. Once over the road, turn right and stop at the grand entrance to Burley Hill House. 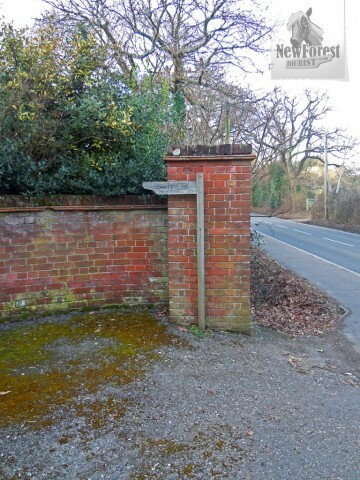 By the large red brick wall is a very out-of-place dilapidated footpath signpost, pointing straight at the ornate wrought iron entrance gates to the driveway. You’ll be forgiven for thinking that someone had turned the sign as a practical joke, but don’t be deterred. Ignore the main gate and smaller gate to its left; head for the small gate on the right. This is where you pick up the path, which leads you (well-enclosed and separated from the private land) up to some fairly uninviting woods. I found the woodland path leading up the hill slightly oppressive. This feeling was aided not only by the narrowness of the path and the high, unambiguous wire fencing on either side, but also (and mainly) by the numerous and clearly displayed “STRICTLY PRIVATE. 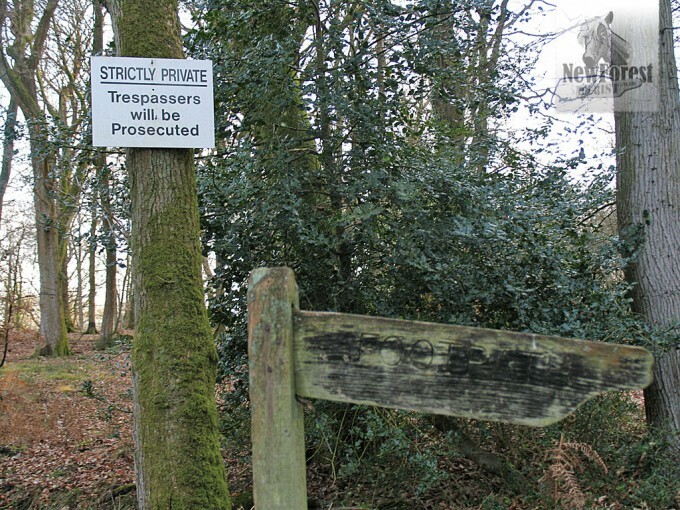 Trespassers will be Prosecuted” signs nailed to almost every other tree all the way through. I got the distinct impression that the word ‘Prosecuted’ would have been not unenthusiastically amended to read ‘Shot’ had the law allowed. This oppressive atmosphere began to dissipate, however, as the hill was crested and the trees became less dense. At the end of the mercifully short woodland section you’ll come across a small stile. At this point turn left and walk for about 100 metres until the fence on the right gives way to woodland, into which you will head, choosing an ambiguous path and leaving the track. As I edged around the woods I was stopped in my tracks by the most amazing view over the aforementioned and aptly named Kingston Great Common. From this point on it’s all open forest again, and for me this made the whole walk worthwhile. 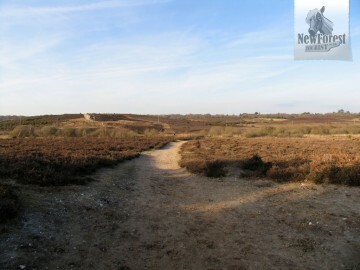 As you head down the hill you’ll see a white sandy clay path running perpendicular to your position, and when you hit it, turn left and just keep going through more beautiful heathland. As we passed through a small clump of trees we were rewarded by the sight of a large herd of deer up to the left along the line of trees. There are one or two houses dotted along the hill top as well, but over to the right it’s all forest. Eventually you’ll come across Long Pond, and as we passed this (leaving it to our right) we threaded our way through the piles of freshly cut logs onto quite a muddy, boggy path which led all the way to the road, easily identified if not by the noise, then by the telegraph poles lining its length. We spotted our car quite a while before we spotted the road, and we headed straight for it after a very varied but ultimately rewarding ramble.